Over the weekend I did finish October Frost, it's washed and is drying right now (this minute: drying). Once the needles were free, I was able to cast on for a new project! This is the beginning of my Basic Chic Hoodie, but I'm doing something to it (you know me, can't leave well enough alone). Several years ago I saw a picture of a turtleneck with a really great stripe pattern to it (click the link for the details and a picture - scroll down past the armwarmers). I loved the stripes, but I didn't want a turtleneck (they tend to make me crazy by mid afternoon) and I didn't want to knit a pullover a 4 stitches per inch either. I printed up the pattern and put it in the notebook where my knitting patterns live (I now have 3 notebooks, but we won't go there). Periodically, I would take it out and think about it and then put it back away. Then a few weeks ago, Bonne Marie released her Basic Chic Hoodie and I knew at once that this was the pattern I wanted to use the stripes in. I hit Elann for the yarn (Peruvian Highland Wool - love it!) and sat down to do some figuring. In the original pattern the row gauge is 5 rows per inch. In my own version I'm getting 6 rows per inch. There are 62 rows of stripe in the original version, which comes out to about 12 1/2 inches. At my gauge the stripe section would be just over 10 inches, so I knew I needed to add 13 rows. I made the decision to add these to the most obvious stripes, the dark royal blue at the bottom and the orange at the top, because of two reasons: I'm lazy and this was easy, and those two stripes were the most affected by the change in row gauge. The others will be far less noticeable. The other thing I had to do was re-write the stripe order because while the original version was knit from the bottom up, the Basic Chic Hoodie is knit from the top down. 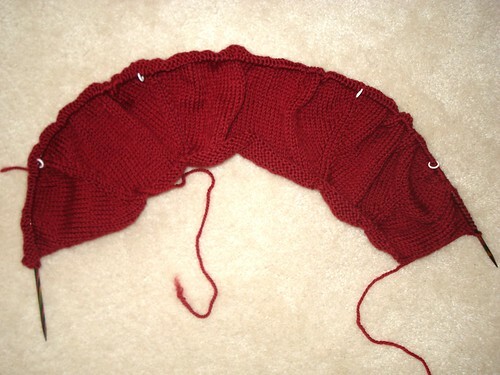 What you see above is the beginnings of this sweater from the neck down. (You go back later and add the hood.) I did some debating about front bands- I could either knit them on later in red or I could add them to the front edges and work them in garter stitch in the stripe pattern. I decided to go with adding them on later in red. This will give a vertical red line at the front, but it will also camouflage all the ends from color changes and I'll be more successful at buttonhole placement doing them later (and vertical lines are good). Once I get farther along and make sure the stripe section is working the way I want it to, I'll post about the changes I've made to it and give you the color numbers I'm using - just in case you care. This will be a fun project to watch. Be sure to show us progress pictures!